Dave Shipton, as always, takes that honour. Scrabble thru your scrap box and get one in the air ready for when (if) the sun shines, the lift is abundant and the wind disappears to nothing, or am I kidding myself? We have 7 models under construction. The SF committee intend that the motor and battery or close alternatives should be used to minimise power advantage across the board. The above is 65Watts 8 amps static and is plenty powerful enough. Mine has a GWS 6 x 3 propeller but a 6 x 5 , 6 x 6 or 7 x 3.5 might be more appropriate. 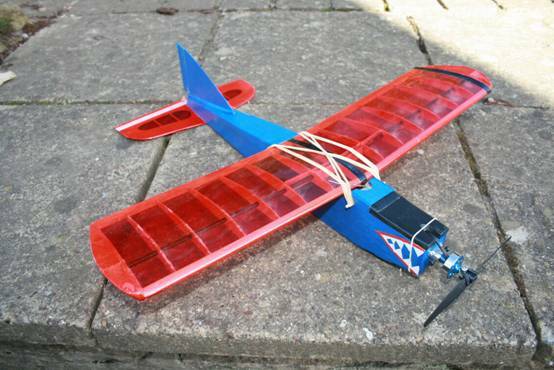 The wing was built with a Poundland spar, not the ideal method for a high 'g' pylon turn. Worth a try, light but not too good in bending. There is only half an elevator set up for ACW racing with this arrangement tending to keep the nose up in the turn, I hope. Finish is AirSpan on the fuselage and left over Oracover on the flying surfaces. Control surface hook up is torsion bar and Kevlar pull string. Weighs about 180gms of which 95gms is airframe. Sharkface does not yet have her eyes and has been modelled on the Basking Shark with gob at the front for feeding in the manner of my dog who eats anything that is about with its mouth on Hoover duty most of the time.